The weather station at Almeria is situated at 7m above sea level, close to the Mediterranean. This area has one of the mildest winter temperatures - the data listed here shows Almeria to have the warmest temperatures from October to April. To the south west of Almeria, is a low lying peninsula, including the resorts of Roquetas de Mar and Almerimar which will have a good warming effect in winter and coolingin the summer from the surrounding Mediterranean sea. North of Almeria, between the Sierra Alhamilla and the Sierra de los Filabres lies the Tabernas desert, the only desert in western Europe. The desert, by definition, has less than 250mm or 10 inches of rain per year. Mojacar (northern Costa de Almeria) is backed by the Sierra de Cabrera rising to 960m and then the foothills of the Sierra de los Filabres (around 500m at Lubrin). In all of these mountain areas temperatures are likely to be lower by 0.7 deg C per 100m altitude and the weather can be very localized. 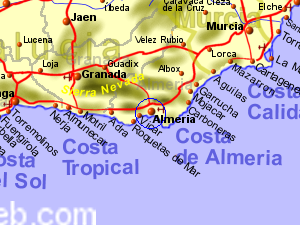 The average rainfall for Almeria is 225mm or 8.8 inches (Source: World Climate), making it the driest area in Spain.